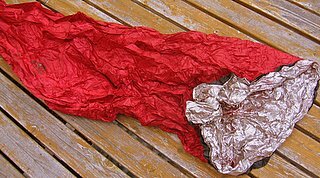 I’ve been caring a Western Mountaineering Hot Sac vapor barrier liner, instead of a space blanket, since 2003. It’s like having an electric blanket in your pack. Just crawl inside and it offers up instant warmth. Stay too long and you will wake up in a pool of sweat but you will be warm. At first I also used it as a pack liner but that’s hard on the reflective coating. It weighs 4.5 ounces; worth it to know that no mater how cold and wet my world gets, I’m going to be sleeping warm. A zipper would be nice so that a person could control the temperature. That would also make it useful as a sun tarp. Western Mountaineering says it’s a proprietary fabric; too bad because it would be nice to make my own.